I often hear that during events. Already shooting for the media a couple of years. And a few years ago I had made a photo which was sold world wide. Even used in a live broadcast of CNN news. Now, the past 2 years or so, I see a lot of people being jealous that I still work with Pentax and sell photo's of accidents and events, and they are more often pleased to let me take a photo above others using Canon or Nikon. Outstanding. More power to you. Keep up the great work. 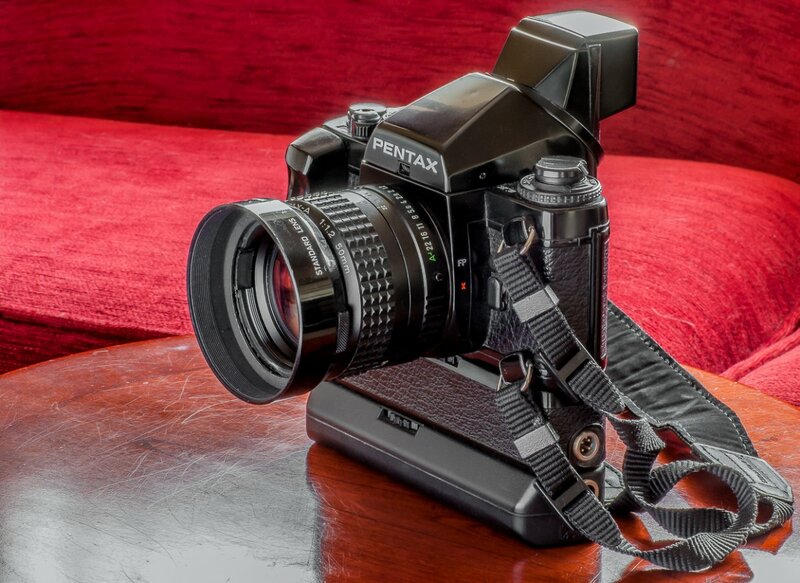 In a land far away and time farther away, I did use Pentax as a Photojournalist. I've since grown past that. At one time in my working life long ago in the Middle East, I dumped all my four (what was considered professional tools at the time) Nikon F3s with MD-4 Drives and lenses for Pentax LXs, Drives/NiCad Packs and lenses. That's two in use while two were being cleaned, Pentax just seemed to have better dust/sand sealing and didn't require cleaning every week, I'd get possibly two or three weeks or more before cleaning. Trust me sand in the film gate puts a beautiful score across the emulsion on film. Photoshop had yet to be invented so touching up (PP) involved heaps of time and using an actual paint brush, either on negatives, prints or both. I've still got a couple about he place... this one even has a battle ding on it on the viewfinder base housing. Last edited by Kerrowdown; 10-21-2018 at 09:33 AM. Great story about your experience with your LX...any adventures you would like to tell us about your experiences with your LX's in your working life ? Love the pix of your LX with 50 F 1.2 and motor drive. Impressive unit. BTW, I've got an old Canon F-1 with a similar dent in the viewfinder housing. Adds to it's character, IMHO. I should elaborate, the reason I quit photojournalism...........I can't stand people and the politics that go with it. Now I'm a happy nature photographer. Critters can't complain if they are not positioned in the correct light! Haven't seen any photojournalist using Pentax. Know one retired one that told me they used to use Pentax in the film day's at the newspaper. I do use one of my two camera's but I am not a photojournalist (radio&tv). I had the pleasure of meeting Dominique Schreckling at Photokina. We quickly agreed that Pentax doesn't seems to move with any reasonable speed, and how unnerving that was. Just a couple of years ago, I shot for an university newspaper for about a year, so this is more similar to local news on a shoestring budget (everyone in photo was using their own gear). I know it wasn't a national newspaper, but it had a print edition. I've seen my concert photos, color at about iso 12,800 with my k3ii, printed and they looked perfectly fine. Most assignments were not for front page all-photo or photo essays, so high resolution wasn't a requirement, our guideline was to submit at around 2000px on the longest edge, to speed up uploads and edits The only place I consistently saw photographers (local news) with expensive gear such as 1D or D5 was for sports. Last edited by aaacb; 10-28-2018 at 06:34 PM. News paper print isn't to demanding. Except the glossy they ad to the paper overhere in the weekend. Most print is 200 dpi, so for most prints even 1000 pixels is enough, for the larger images a little more. I have a friend who used to work for the St. Louis Post-Dispatch, who used Pentax. He's retired now, but worked for them for years. and always used Pentax, and of course that was in the film days. I'd forgotten about Bob when I wrote before about my experience.